Today at the Music Room, we did not talk to one artist. We talked to three. Alanna, Roseanna, and Jonathan Brown, living in Windsor, London, are here in NY on their third visit to the US, after their performance at the NYC CMJ festival last October. Their group’s name The Rua, comes from the Hebrew word “ruah” meaning “essence of a group,” and the Irish word “rua” or “red.” Given the siblings’ Celtic roots and soaring melodies on the violin, this choice seems very appropriate. That being said, The Rua is best known for their percussive guitar style, rock genre, and thematic lyrics. 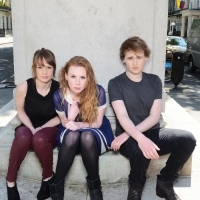 Although the siblings have fairly distinct roles, with Alanna on piano, Roseanna providing vocals, and Jonathan playing the violin and fiddle, all three are familiar with various musical disciplines, and consequently are attentive to each others’ individual parts…a very useful advantage when co-writing songs. They have also collaborated with Nigel Harrison, a bass player from London, and Portishead drummer Clive Dreamer, and this December at France’s RFM Studios, broadcasted an acoustic version of their song “Without You” from their Essence album of last fall, a version that has apparently never been replayed…until now. The Browns also discussed learning curves during their career, their tour in Rome, the importance of music education, their role in the Harry Potter movies, and ginger stereotypes. (Recorded live 03/03/15; host: Mandorichard), 31:35, 30.3 MB.